Durable, user-friendly and one of the most famous systems and Russian SOF operators gear elements in the world. Suitable for green-side combat and allows to has always enough ammo and all necessary equipment elements with you. Also, it suits perfectly for reenactment of different Russian SOF units, like FSB, GRU etc. and also it`s your best choice if you decide to make Russian Spetsnaz Operators from Rainbow Six cosplay. Besides that, if you’re playing a lot in greenside, it's very suitable for firing, movement and reloading, while you're laying down in case of ambush and it gives you more advantages, making your profile lower. Main difference between Molle and classic Smersh - Molle version pouches placed on Molle. They can be replaced, changed or removed, if you need it. 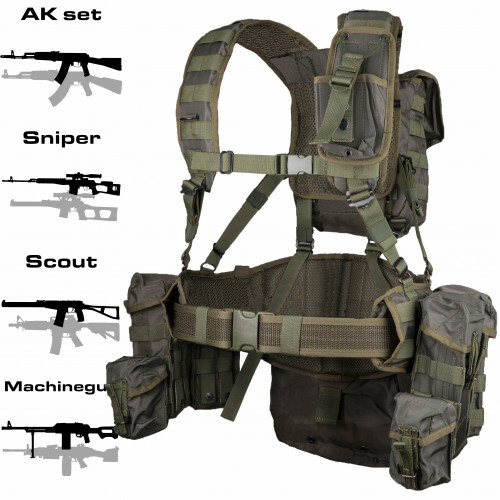 Plus, you can place ANY Molle Pouches on Molle Smersh.